Because When You Sleep Better... Life is Good! Sleep has a direct impact on your health. Why not invest in a better quality of life? At SnugFleece, we've been helping people do just that for over 18 years now. We'd like to help you too. From arctic cold to tropic heat; wool works because of its ability to act as a natural thermostat. 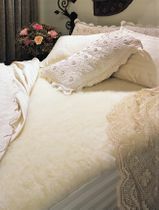 In summer you snooze cool because of wool's ability to wick moisture away from you on muggy, hot summer nights. A single fiber can absorb 30% of its weight in body vapor thus cooling you down. No more sticky sheets! In winter you doze cozy because wool is a natural insulator. Air spaces between the fibers trap body heat and circulate warm air next to your body. You are warm on the coldest nights. Summer or winter, you'll look forward to going to bed. You'll experience an undisturbed, quality sleep like never before. All SnugFleece Woolens' products are made from 100% American wool, which has a much higher degree of crimp than its foreign competitors. 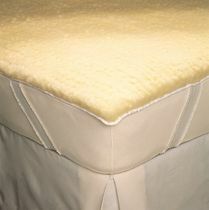 Therefore, American wool has a superior "springiness" that will add life to your mattress cover. Sleep Soundly, Sleep Better Wool's naturally crimped fibers form a springy, cushioned support that cradles your body, relieving pressure points, muscle aches and back pain. Nothing soothes the body and reduces body fatigue like wool. You sleep better on wool because you quickly fall into a deep, restful sleep. In the morning, you're recharged for the day ahead. While wool is not a miracle cure, it has soothing qualities that help those who suffer from arthritis, rheumatism, and injuries. Hospitals have used wool for years to enhance their patient's comfort. It is a natural sleeping aid for a better night's rest. Sheets protect your cover so it will require little cleaning. 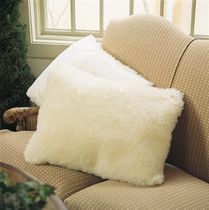 Wool's low static fibers resist dust and staining, and its natural lanolin oil resists liquids. Occasionally leaving your bed unmade during the day will allow your SnugFleece to breathe and rejuvenate itself. Because of the natural resilience of the wool fiber, your cover will spring back to its original shape with a simple vacuuming. The SnugFleece Original and SnugFleece II can be dry cleaned. All SnugSoft products are machine wash and dry. Environmentally Safe Wool and cotton are natural fibers. What more natural way is there to produce a material than to grow it on the backs of sheep? You can rest easy knowing that synthetic materials were not released into the environment for the manufacturing of our products.